1. I made a trip to Manchester for my first MA tutorial. I didn't say anything too ridiculous, but I did nearly fall over getting there. Think baby giraffe trying to stand up for the first time and you'll get a bit of an idea as to how silly I must have looked. I really can't go anywhere without doing something ridiculous but it's fantastically liberating being able to laugh at yourself without feeling embarrassed. It was also really nice to meet some of my fellow students in person. Distance learning can sometimes feel like quite a solitary experience, so it's nice to be able to put some faces to names and remember that we aren't completely alone as we're furiously writing our assignments as deadline day fast approaches. 2. I'd never been to Manchester before so I booked a hotel and Mark and I stayed overnight. We had an evening together in the city and it was really lovely. We went for dinner, we walked a lot, Mark had multiple cups of bubble tea and I did a little bit of damage in the poetry section of Waterstones. We also went to the Vogue exhibition at the Manchester Art Gallery, which is well worth a look around if you're in the city, and we both left feeling very inspired. It was also wonderful to be able to see some of L.S. Lowry's work in person there. 3. After deleting the Instagram and Snapchat apps from my phone, I've rediscovered my love for Tumblr. When I was little I had a scrapbook and would spend hours cutting and pasting things into it, a skill which became useful when I began studying photography and we had to put together sketchbooks showing our inspiration, thought process and journey to producing our final images. There's something very beautiful about having a place to virtually paste a bunch of images that I really love, or that inspire me in some way, that I can look back on. 4. Charlotte from Fox Socks has started a new project called Blog Socks, which you should drop by if, like me, you know that there are a bunch of wonderful, unique blogs out there that you haven't stumbled across yet. I was honoured to be one of the first people Charlotte interviewed and I know that Blog Socks is going to add many new reads to my subscription list. 5. 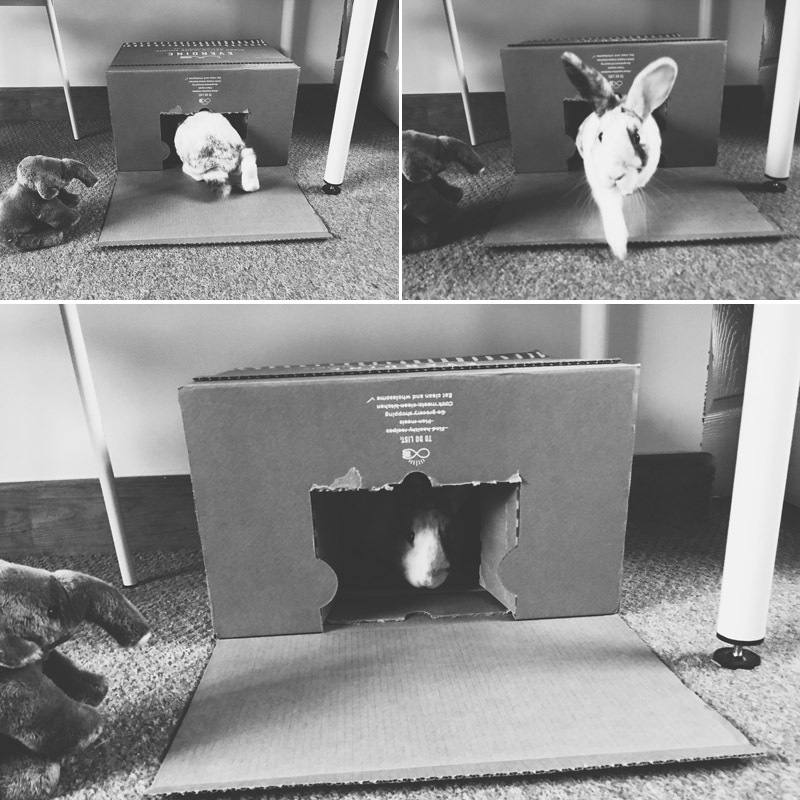 I'm going to be writing a post for Everdine at some point over the next week or so, but the box that they sent everything inside has become a new bunny retreat for little Beatrix. I've filled it with shredded paper and hay and she looks so cosy when she's in there, I'm actually a little bit jealous! 1. I must spend an afternoon reading the new illustrated edition of Harry Potter and the Chamber of Secrets before the month is over. It's always been my least favourite of the series, for reasons I can't really explain, but I'm really looking forward to reading it again alongside Jim Kay's incredible illustrations. It feels like a real gift being able to read a much loved series again, with a whole new, unique vision. I've already had a little peek inside and there's an illustration of Dobby that is just so perfect it almost makes me want to cry. 2. Carve a pumpkin. Under the thickest layer of fog I used to think, what's the point? It's only going to go really icky in a few weeks. But I'm beginning to see the point again. It's about doing something. Being enthusiastic about something. And just feeling something. 3. Give myself permission to fail. Somewhere along the way I've learnt to be my own worst critic and it's both useful and deeply unhelpful depending on the situation. Sometimes I have an idea I want to pursue, or a concept that needs some ironing out, but I never actively work on it because in knowing the first version isn't likely to be what I think it could be, I instinctively want to avoid trying and failing. I'm not scared of failing, I know it's how we learn and grow, but I am always slightly worried about investing time into the wrong thing. It's like my time is running too quickly through my hands, which is strange because I fundamentally believe that it's never too late to try something new, or to change your mind. So I'm giving myself permission to spend time doing something, even if nothing ends up coming from it. Has October been good to you, so far? Yay you're doing your MA! Amazing! What's your subject? It was a decision between English and Creative Writing, but I went with English in the end! I love your last point, so so much. Failure is something I'm really struggling with right now, but in a different way. I'm currently feeling sorry for myself suffering with a cold on the sofa and trying to convince myself that not doing any blog work is OK. It's so hard to convince your mindset. I'm glad you enjoyed your time in Manchester, it is really a lovely and even though I have friends living there I don't spend enough time there myself. Where did you stay and was it nice? We stayed at Motel One, and we were very impressed. Affordable, comfortable and they had a great hotel bar!